Hey guys and gals. Gig alert! 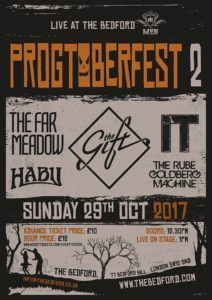 So we are part of Progtoberfest at The Bedford, Balham on 29th October. This is likely to be the only London date this year, so we would love to see you all there, it’s a going to be a great Sunday with great bands! We are joined by The Gift, The Far Medow, Habu and The Rube Goldberg Machine.